When I was growing up, every summer we'd hop into the family station wagon, hook up the pop-up tent camper, and head off around the country for three weeks. We thought we were roughing it, tougher than those other sissy campers, because we didn't have plumbing and electrical hookups in our camper. I'm never going to whine again about having had to lug a 5-gallon jug of water a few hundred feet. Chris Murray's family hopped in two Land Rovers, jerry cans of water and petrol under the children's feet, and headed off into the sub-Saharan for a year; the family was the entire staff of a hospital without electricity and with very few supplies. Their home had air-conditioning but no windows so, without electricity, they couldn't stand to spend any time in it. Murray's father was a doctor and his mother was a micro-biologist so it's not altogether surprising that he grew up to be involved in a career having to do with health. But that trip, and the subsequent summer expeditions that followed it, set Murray on the course of his life work. Some years ago The Immortal Life of Henrietta Laks surprised me by being one of my favorite books of the year. Me. A girl who's idea of science was formed in the eighth grade by a teacher whose name was, I kid you not, Mrs. Boring. I've long since learned that science can be fascinating but to be able to become enthralled by a book about it was still a surprise. 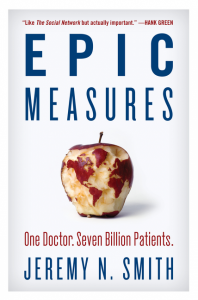 Epic Measures: One Doctor, Seven Billion Patients proves that was not a one off. Like that book, though, Epic Measures is about so much more than science which is probably why it appealed so much to me. It's about one remarkably complex man who drove a team of 500 scientists to do the impossible. It's about the disconnect between so much of the data researchers have collected, the way theories are constantly changing, and how, sometimes, the obvious is overlooked. It's also about the marriage of medicine, demographics, and humanity. And while it's chock full of science and data, I never felt like I was in over my head. So many questions raised, so much learned. A science book I could not put down. Who woulda thunk it? Thanks to the ladies at TLC Book Tours for including me on this tour! For other opinions, check out the full tour. 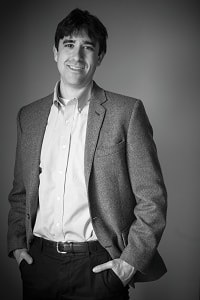 Jeremy N. Smith has written for Discover, the Christian Science Monitor, and the Chicago Tribune, among many other publications. His first book, Growing a Garden City, was one of Booklist‘s top ten books on the environment for 2011. Born and raised in Evanston, Illinois, he is a graduate of Harvard College and the University of Montana. He lives in Missoula, Montana, with his wife and young daughter. Find out more about Jeremy at his website. If you're a reader of the Maisie Dobbs books, you'll know that Winspear has spent quite a lot of time building up Maisie's relationship with James Compton. Winspear never resorted to the easy to exploit rich-family-looks-down-on-son's-relationship-with-the-help's-daughter scheme. Neither did she rush Maisie down the aisle; instead, making the relationship between James and Maisie more complicated and interesting in a time when young women were more likely to be looking to get married rather than to become career women. The problem, of course, is that, eventually, something had to happen, given that James wanted to be married. In A Dangerous Place, Winspear finally had to make the decision about how she was going to work around that. But Winspear never wanted to write that kind of book. Hence, "the deepest tragedy," which felt rushed to me, although I understood dwelling on it was not the book Maisie Dobbs fans want to read nor, perhaps, the kind of book Winspear wants to write. It doesn't, however, simply disappear. In A Dangerous Place, we meet a deeply wounded Maisie, struggling to find a way to move forward and unsure if she even wants to do that. But when she, literally, stumbles across a murdered man, Maisie finds herself drawn into solving a case that the police already consider solved. 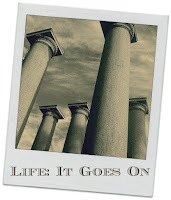 More and more, as she digs deeper into the man's history, Maisie finds herself again. When news arrives about the slaughter in Guernica, that tragedy begins to help Maisie deal with her own grief. But it also brings to the fore all of the political elements at play and throws a new light onto Maisie's investigation. 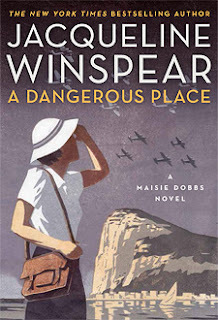 A Dangerous Place gives Maisie Dobbs fans exactly what they want from one of Winspear's novels - a murder mystery with a deeper context (here the Spanish Civil War), an intelligent heroine with a full life, and a balance of light and dark. Sometimes that lightness gets in the way for me (I don't really need to know what outfit Maisie selected to wear each day), but I always appreciate Winspear's ability to use events of the past to address problems we still struggle with today. The best part of this book? Getting back to Maisie, may just have broken me out of the reading rut I've been in for weeks. Thanks, Jacqueline Winspear! And thanks to the ladies of TLC Book Tours for including me on this tour. For other reviews about the Maisie Dobbs books, including the latest In This Grave Hour, check out the full tour. 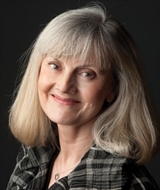 Winspear is the author of the New York Times bestselling Maisie Dobbs series, which includes In This Grave Hour, Journey to Munich, A Dangerous Place, Leaving Everything Most Loved, Elegy for Eddie, and eight other novels. Her standalone novel, The Care and Management of Lies, was also a New York Times bestseller and a Dayton Literary Peace Prize finalist. Originally from the United Kingdom, she now lives in California. Despite their fears of leaving home and the sacrifices that their families would face, the women joined the team. And as Babb coached the Cardinals, something extraordinary happened. These remarkable athletes found a passion for the game and a heartfelt loyalty to one another and their coach—and they began to win. This book initially landed in my mailbox unsolicited. It sounded interesting but I was busy and knew I wouldn't get a chance to read it any time soon. But I did know someone who I knew would be interested in this one, so I put it in the hands of my brother-in-law the first chance I got. He coached girls basketball for a number of years, beginning just a year after girls started playing basketball in Nebraska. He has thoroughly enjoyed it, the history, the basketball, and the coaching. But I doubt he learned as much as I did from it. Because, although I knew that girls had been playing basketball in Iowa for years before they started playing in Nebraska, I still had no idea how long girls had been playing basketball in this country. Nor did I ever know why girls in Iowa had played the three-on-three, half court game they long played. 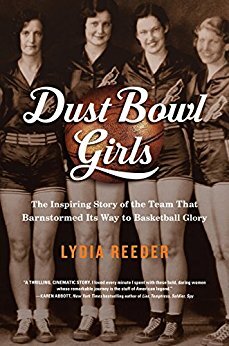 I assumed, going in, that the Dust Bowl Girls were similar to the women who played in the All-American Girls Professional Baseball League during World War II, a group of women who filled in for men when the need arose. Women, it turns out, have been playing basketball since James Naismith invented the game. In their own yards, on the local playground, they hiked up their skirts and played like the boys. Almost as soon as women started playing, though, restrictions started being put on the ways they could play. Divided courts, no dribbling (yep, that was a rule for a time), and, in 1908, the AAU said women could not play basketball in public. The Women's Division of the National Amateur Athletic Federation worked to ban extramural games and tournaments as "too competitive" for women. Most competitive teams actually played for companies, not colleges. In a time in our country when people were struggling just to find the money to feed themselves, college was not even a dream for most people. Into the lives of a group of young women came Sam Babb offering a free education and a chance to play basketball. Dozens of young women answered the call but life as a girls' basketball player wasn't easy (they had to practice at 4 a.m. in a gym that didn't even have the heat turned on until later in the day) and, eventually, Babb's team was winnowed down to the girls who most wanted to play. Girls from small towns and farms all over Oklahoma who were required, in addition to their studies and practice, to help teach the Native American children who also went to school on the same campus. Not only that, but in order to cover their costs, the team had to "barnstorm," playing games to earn money. Reeder spends a lot of time early on giving readers Babb's own history. It felt like the focus of the book, the girls, had gotten away from Reeder and that she was falling into the nonfiction trap of giving readers all of the information she had uncovered in her research instead of sticking to the story she wanted to tell. Or as if Reeder had a particular interest in Babb. It turns out Babb was Reeder's great-uncle. You can hardly blame a girl for wanting readers to understand her particular gateway into this incredible story. And it really is an incredible story, full of American history, sports history, women's history. Although Babb's team didn't end up playing for a gold medal in the Olympics, the book reminded me very much of Daniel James Brown's The Boys In The Boat - a group of unlikely athletes and a driven coach persevere against the odds and rise to the top. Only this time, it's a story we can use to show our daughters how women can do anything they want if they want it badly enough. I read a book! I read a book! Also, I realized that I have two books that I finished but never reviewed so there will finally be lit on Lit and Life! I also accomplished a ton for 40 Bags In 40 Days. I feel good about the amount of stuff I've gotten out of my house but even better that very little of it has gone in the trash. Some is being recycled, some will be resold, and quite a lot has been donated to be used by animals and people in need. I've discovered an incredible group of women (do men not declutter unless forced to do so?) who are so supportive of each other. 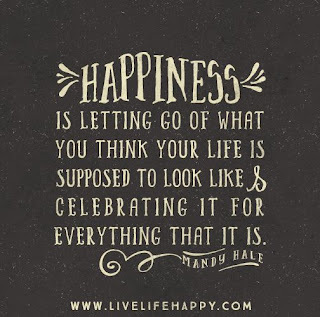 I've learned a lot about why we collect so much "stuff" and about myself along the journey. Listening To: Well, A Gate At The Stairs sure picked up this week. Lots of discussion about race and now a boyfriend's gone rogue in a very interesting way. Can't wait to finish it this week. Also, loving my daily mix on Spotify - discovering a lot of new artists, including The Winter Sounds. Watching: Lots of the NCAA basketball tournament. My bracket was so busted after the two days! Also, Naturally Danny Seo. Have any of you seen this? More and more I'm thinking about ways to do things more sustainably and naturally. Yesterday I watched him make a laundry soap that I'm definitely planning on trying - cheap, healthier, and you can make it your own scent-wise. 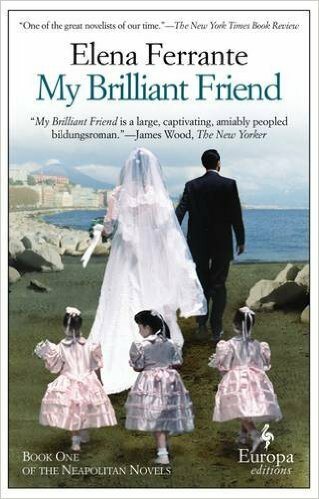 Reading: My Brilliant Friend by Elena Ferrante (finally!) for book club. Making: Reuben sandwiches for St. Patricks Day - our way to do corned beef and cabbage in a way we love. We're clearly not alone in this - all of the ingredients were on sale this week so I bought enough to have them again this week. Yum! Today I'll be making a couple of pans of bread pudding, thanks to 99 cent baguette loaves, one to take to a friend along with dinner. 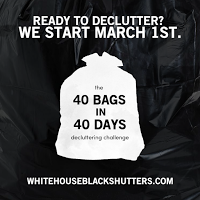 Planning: On hitting the basement (read "dumping ground") this week for 40 Bags. Wish me luck! Everything up to this point was just warm up. Thinking About: Miss H's bedroom. I spent most of yesterday cleaning in there while she is away. A black trash bag plus two more grocery bags of trash and a box for donation all came out of that one bedroom! Since she moved home and into her brother's old room, she's been living with hand-me-down bedding and curtains; now that the room's in order, it's time for new girly bedding and curtains! Enjoying: Snapchat, Facebook and text updates from Miss H while she is off to Arizona for the week with friends. They have enjoyed St. Patrick's Day in a new city, some spring training baseball, and a hockey game (who knew there was a professional hockey team in Arizona?!) so far. While she's gone, I'm doing 40 Bags in her room. Ssshhh! She'll never know if I got rid of things if you don't tell her! Feeling: Congested. Thanks for sharing the cold before you left, Miss H! Looking forward to: Book club on Tuesday and a girls weekend trip to Missouri. Check out the adorable St. Patrick's Day outfit Miss H made for The Princess! Can't wait to see her! Question of the week: Have you ever used homemade or natural laundry soaps? If so, your thoughts? Oh heck, books, blog, me - not really adding up these days. I'm utterly unable to focus on books lately which means I've got nothing to post here. Too many other things to focus on these days when I can focus - wedding planning, life stuff, and 40 Bags. Ugh, life. I haven't even remembered to dance yet this month! Listening To: I'm about half done with A Gate At The Stairs; I must say, it's not what I was expecting at all. 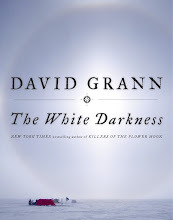 While I've been working out, I've been listening to Slate's Audio Book Club. I finally found book they like - Zadie Smith's NW, which, upon listening to them, I discover is a whole different kind of book when you read it instead of listening to it. Watching: Some Longmire, The Voice, high school basketball. Again, not much focus going on. Reading: Finally reading the Maisie Hobbs book I was meant to review last week but didn't get until Thursday. Making: Beef stroganoff, tostadas, and pies for my dad's birthday (chocolate French silk and a new-to-me strawberry/rhubarb pie which was a big hit). Planning: On doing taxes this weekend. Ick. Thinking About: Hiding my cell phone in the evenings. Seriously. I'm certain it's contributing to my inability to focus. Enjoying: 40 Bags In 40 Days. Fourteen days in and I've thrown out or recycled thirteen bags, have three boxes and two bags ready to take to the Goodwill, and two boxes and two bags to take to a homeless shelter and the humane society. Forty bags is going to be no problem at all! Feeling: Like my reading rut is not going to end any time soon. When you're reading books you're enjoying and still don't have any interest in picking them up, that's bad. Looking forward to: A trip to see my great-niece (next week. And, of course, the rest of my brother's family. But mostly my great niece, who will be five months old by then. 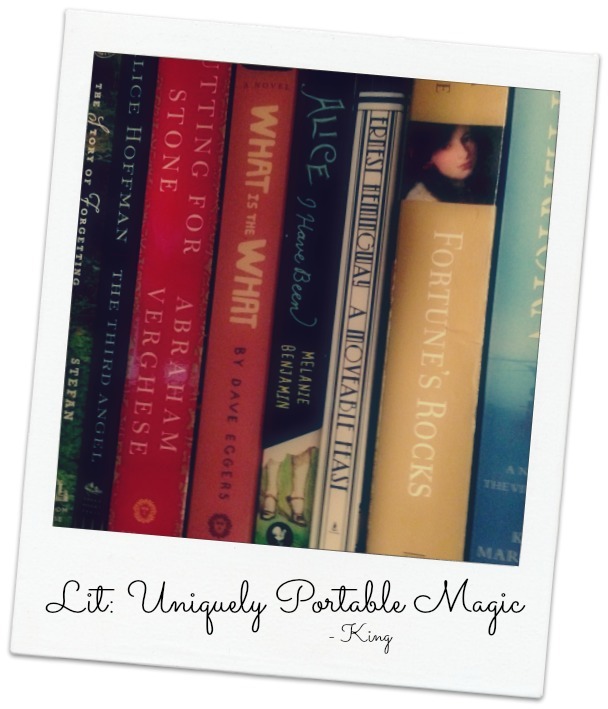 Question of the week: How do you break out of a reading rut??? 1. Let It Go: here's where the 40 Bags comes in. I have a plan for 40 different areas in my house to work on. I fell behind on but worked hard this weekend and have two rooms done. I've even gotten The Big Guy starting to sign on. A couple of bags of trash have gone out, a couple of bags worth of stuff has gone into recycling, a bag is ready to donate, and a bag of winter gear will go to a local homeless shelter later this week. 2. Take Time To Be Silly And Laugh - Time with friends and family always helps with this one and a trip to see my baby great-niece later this month will allow me to be ridiculously silly. I just got a new Nora Ephron book to read this month and that lady always made me laugh. Some funny movies will definitely be on the agenda! 3. Lose Some Mental Weight: Tackle A Nagging Task - Once I've gotten through a couple of major areas during 40 Days, I'll decide which task this is going to be. I've got a couple of things in mind, just need to decide what fits but is also realistic to pack into the month. 4. Dance - I used to dance around the house all of the time. I danced as I cooked. I turned on music and danced while I cleaned. I danced with the kids. I can't remember the last time I danced in my house. I'm going to dance again. It will likely be ugly but who cares?! What would you do to lighten up in your life? That little picture? 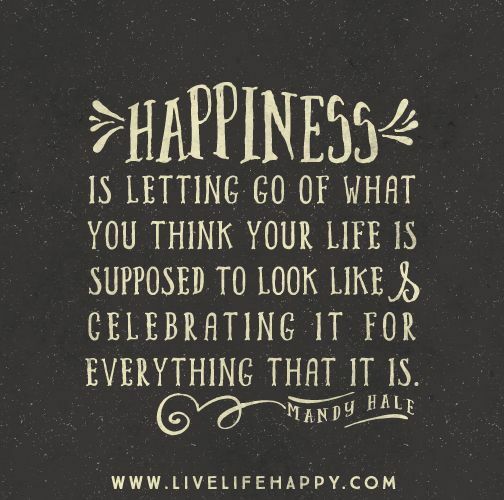 For me, as February wrapped up, that silly little thing was a complete failure at my goal for the month for my happiness project. Focus. Perhaps the thing I most need to work on these days. And yet, I could not make myself stick to any of the steps I set out for myself. I didn't put down my phone. I didn't walk away from the television. I didn't even do any research on meditation nor did I figure out how I was going to measure "stay on tasks." I couldn't even focus on books. It was a struggle to read every page even when I was enjoying the books. I'm determined not to let that slide. 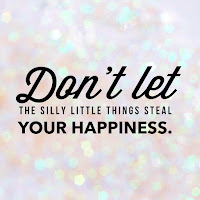 Even as I move into March with a new goal, I'm not letting working on my focus slide entirely. 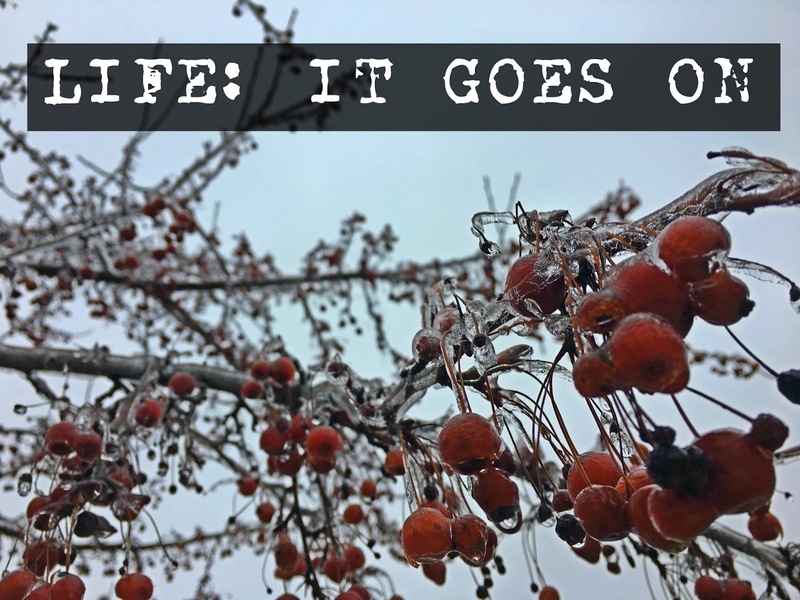 I'm going to build on my little victories - we did leave the television off more often, we were more deliberate about what we watched. 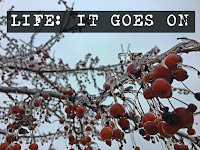 I found a 7-Day Electronics Detox that I may give a try in the coming weeks. And I'm still determined to learn how to meditate. I need it now more than ever. 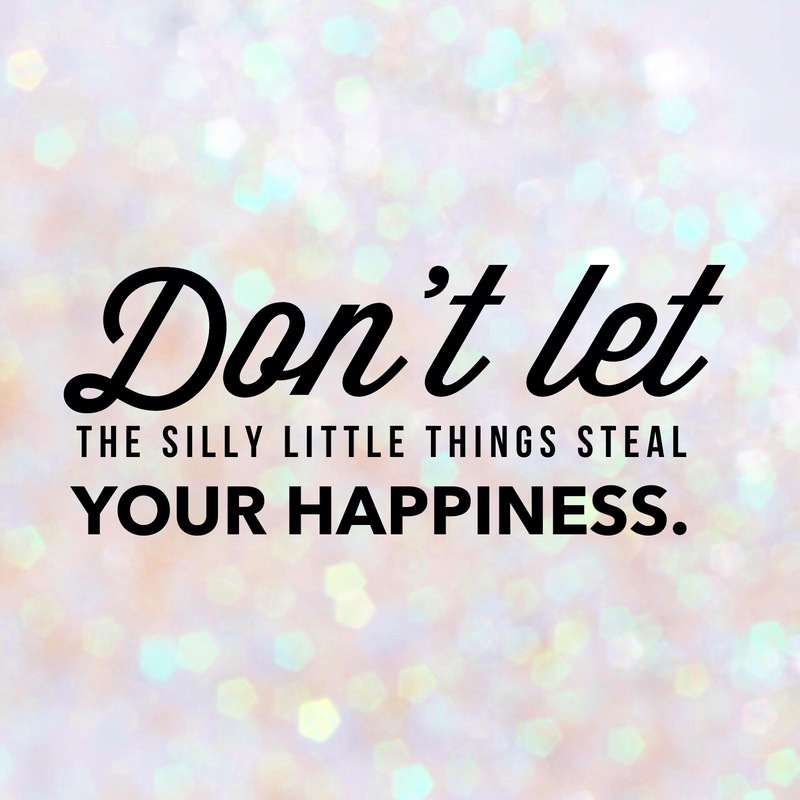 So I'm not letting February's failure steal my happiness. Everyone has their own Hell Room, and Eve's battle with her clutter, along with her eventual self-clarity, encourages everyone to dig into their past to declutter their future. I requested Year of No Clutter a couple of months ago from Netgalley but have waited to read it until 40 Bags In 40 Days started because it's perfect timing, right? I am the person most likely to declutter and purge in my house. But I am also the person responsible for most of the hoarding, too. I'm the keeper of everyone's identity, the person who can't let go of the tiny baby clothes, the kindergarten journals, the t-shirts from every team anyone has been part of, the baptism gifts. My closet is never overcrowded; my kitchen is cleaned out regularly to rid it of things I'm not using. But all of those memories? Those are my kryptonite. I can't wait to read this book and see if Schaub can help me let go of some of those things. After all, Mini-me not long ago told me he didn't really care about so many of the things that I had held onto ostensibly for him. If not for him, why am I still keeping them? 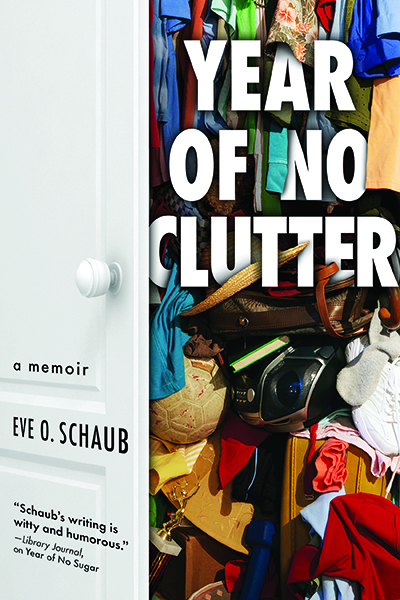 Year of No Clutter is available tomorrow, March 7 at all of your usual book outlets. 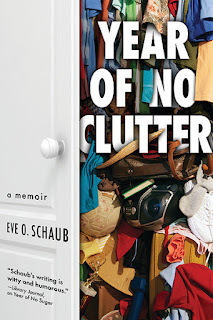 Sign up to receive a daily e-newsletter with tips, advice and videos from Eve Schaub on how to start conquering clutter this spring during the Week of No Clutter, March 7-14. Sign up now! 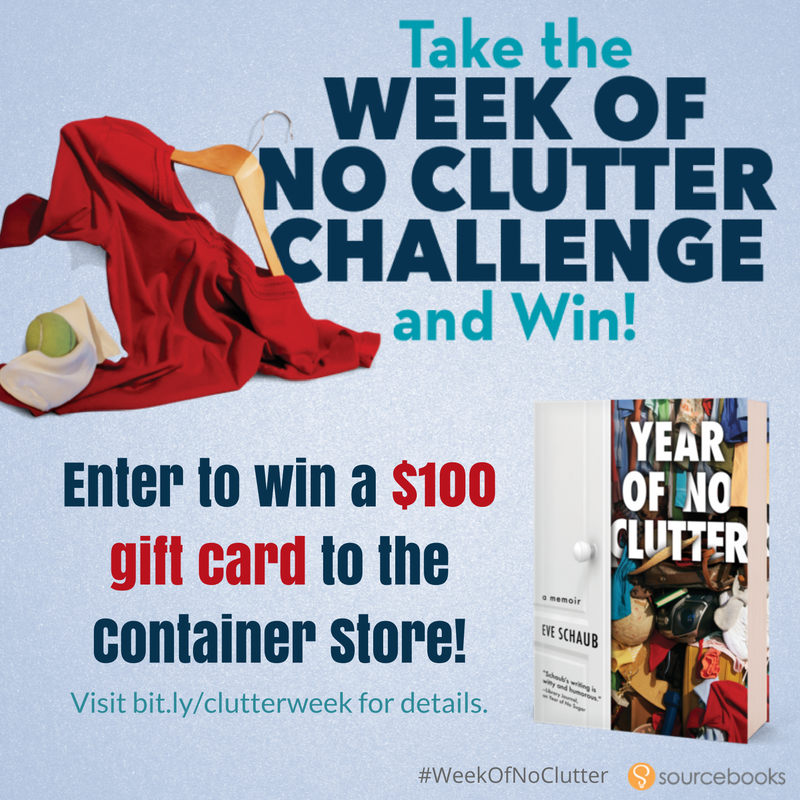 Also, you can sign up to win a $100 gift card to The Container Store. You know I'm already signed up! 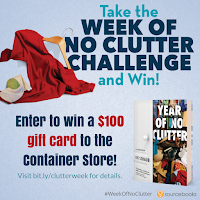 http://books.sourcebooks.com/year-of-no-clutter/. Thank god, because last week is a week we're all ready to put behind us! A lot of drama and even more illness. I won't go into details; suffice to say that all three of us missed at least a day of work. Late Friday I finally found the energy to finally be disgusted by how messy my house was (and how badly I needed to shower) and then I knew I was rounding the corner. So glad it's warm enough again this weekend to throw open windows and air the place out! Listening To: I'm finally able to listen to the news on NPR in my car without becoming so enraged that I'm a risk to other drivers so I'm trying to keep informed during some of my drive time. Otherwise, I started Lorrie Moore's A Gate At The Stairs and I'm really enjoying its "voice." Watching: The new season of The Voice. I adore Gwen Stefani and I'm happy to have her back but I'm already getting real tired of the flirting and constant references to her relationship with Blake Shelton. Plus, what's the point in getting invested if it all plays out to having the country singer win again? Reading: Nothing. Seriously. I have not been able to focus on reading at all this week. But I did get a box of books this week from Better World Books which was a bright spot in the week! Making: Even less than I've been reading. Planning: On getting caught up with 40 Bags In 40 Days. I had plotted out 40 separate spaces and didn't do anything on any of them for the first three days. I HATE falling off schedules! Thinking About: How to beat Level 158 on Two Dots. Because that's about the only thing I've been able to focus on for days. Pathetic. Enjoying: My friend's Oscar party last weekend. How about that ending?! Always a fun night and I'm proud to say that I took back my crown by guessing carefully researching and selecting the correct winners. Feeling: Frustrated by so many wasted days. Looking forward to: Energy. Please come back soon! Question of the week: I've got nothing for you this week. That's how my mind is working just now. Time to clean up all of the links I've been saving! As part of the 40 Bags In 40 Days project, we're "allowed" to include cleaning up computer things as part of the project so that's what I'm working on as I type this up. Now I just need to clean up all of the recipes, home organizing tips, and resistance posts! From Off The Shelf, The New "O" Book Club: 12 Fiction Picks from President Obama - how I'm going to miss having a president who reads. I always loved when I found the President and I were reading the same thing! The New York Times had this great article about Obama's reading, why he chooses some of what he reads and how it impacts him. It really made me think about why I read what I read and how that might change depending on where I'm at in my life. From Book Bub Blog, this list of The 22 Most Anticipated Book Club Reads Coming in 2017 had me leaving some open spots in my book clubs schedule for the year. I prefer to either read any book I add to the calendar or get a good amount of feedback from all of you about books I'm considering so I won't add any of the books just yet. Have you read any of these? Any you would recommend? From Longreads comes a list of 10 Outstanding Short Stories to Read in 2017, with links to the stories. I have a tough time with short story collections but one story at a time might just work for me and there are certainly some well known authors on this list that deserve reading. What's your take on short stories? 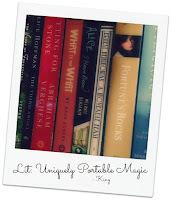 At the end of every year, I scour the "best-of" lists of books, trying to decide which books I missed from that year absolutely need to be kept high on my TBR list. This list from Buzzfeed of The 24 Best Fiction Books of 2016 has a lot of the books I've really been keen to get to (as well as some I read and concurred with). How many of these have you read? Do you agree with them making the list? I've made no bones about how I feel about our new president so it won't come as any surprise that I saved this list of 11 Books to Help Us Make It Through A Trump Presidency from Book Riot. I'm patting myself on the back for making it a 6 weeks but this isn't a spring, it's a marathon so I'm definitely going to be picking some of these up. Florinda of The 3 R's Blog also has had several recommendations including The Last Post-Election Reading List. And, finally, this great interview with George Saunders, author of Lincoln In The Bardo, and Ron Charles from The Washington Post.